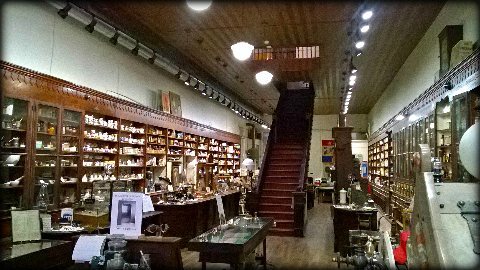 The Pharmacy and Medical Museum of Texas is a dream come true for Mr. Joe Reuss. For years Mr. Reuss had a vision of creating an educational museum focusing on the pharmaceutical and medical fields and also to preserve Cuero’s rich history in these areas. Coming from a multi-generational medical and pharmaceutical family “that never threw anything away,” Mr. Reuss has a vast collection of material that deserved to be preserved and displayed in an appropriate setting. With the consolidation of the Valumart Pharmacy with Reuss Pharmacy in 2013 the building, already owned by Mr. Reuss, became the ideal location for a museum. The building, built in 1889, by the Heaton Brothers, was designed to be a pharmacy/drugstore and never housed a different type of business until it became a museum. 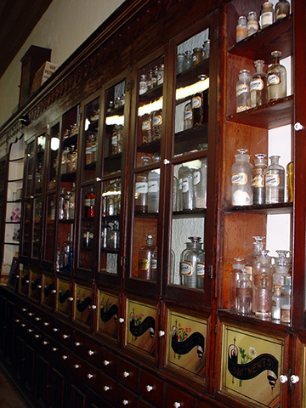 The interior is amazingly intact with the original 1889 wall cabinets, display counters and the pharmacist’s preparation bench in their original locations. The first floor has been beautifully restored and houses displays of items from the late 1800’s through the early 1900’s. Walking through the various displays, one quickly realizes that early pharmacy/drugstores sold just about everything, not just medicines and medical equipment. In November of 2013 ownership of the Museum was transferred to the City of Cuero, and it became a branch of the Cuero Heritage Museum. Currently, funds are being sought to complete the renovation of the second floor with an early medical doctor’s office, a dentist office as well as other medically related items. The Museum is staffed with docents who are very knowledgeable and enjoy interacting with visitors and explaining the various exhibits. Hours are Monday through Saturday, 10:00 am to 3:00 pm and Closed on Sundays starting October 2016. The museum is located at 114 E. Main Street, Cuero, Texas. Admission is Free.